Day Two of our King Country adventure started with an early rise, breakfast at the local gas station and then meeting everyone at Neil's place for our pre-ride briefing. Luckily overnight the wind had come up and this probably helped keep the frost at bay. It did however, have a bit of a bite to it so everyone was wearing plenty of layers and those with heated grips were thumbing there noses at those who didn't. As per the plan we were on the road by 8:30 and had a quick squirt up the road before turning West at Raurimu to take in our first gravel of the day. Initially the road had a pretty liberal covering of gravel so I had to grapple with the big DL a fait bit until we got onto some nicer stuff. And we definitely found some as the road opened up near Kaiteiki - speeds were up and the dust was flying. After fuelling up and locating the other guys (different gas station with more expensive fuel) we headed out of town on Ongarue Back Road. This tuned out to be pretty good gravel and although we had a few spits of rain and a hold-up for some stock crossing the road it was a neat little ride that spat us out onto Ongarue-Waimiha Road. The last time I'd been on this road was on the Connie in middle of the night so riding it in daylight on the DL was quite nice although there was a few damp sections which meant you had to keep your wits about you. Puttering through Bennydale and up the road a bit we eventually turned off onto what I reckon was the best bit of gravel of the day. Mangaokewa road was very hard and fast with just the odd bit of soft stuff in places. The Dl was in her element! I could not resist carefully passing most of the other bikes and attaching myself to the back of Neil's Beemer. The only issue on this road was having to avoid a few cattle who had found some greener grass outside of their paddocks. It was fabulous being able to hook top gear and roll on the gas! When we finally ran out of gravel we took Kopaki Road back over to SH4. But just for a while, we soon turned off onto Tikitiki and then Kahuwera Roads which both offered good gravel that eventually led us into Piopio for lunch. 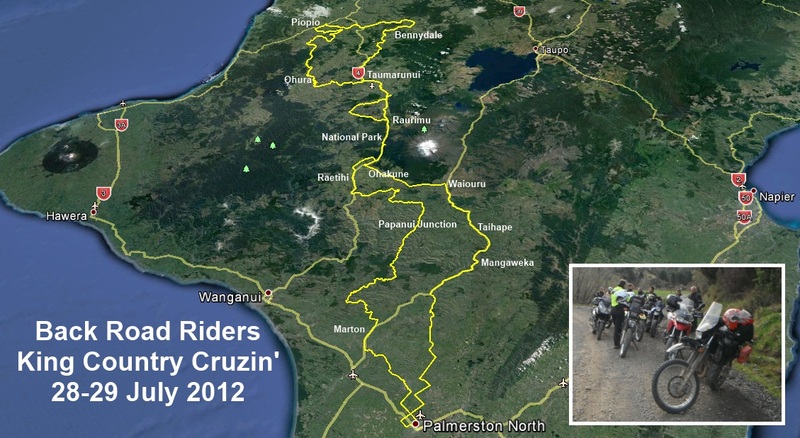 After a nice lunch we rode South on SH3 until the turn-off at Paekaka Road which was gravel from the get-go. It and the next road (Kaitaringa Road) had been pretty freshly graded and felt like marbles underneath me - not quite as much fun as Mangaokewa road! Eventually though the roads got a lot better and there were some nice fast sections as we made our way through to Ohura (didn't actually go into the ghost town that Ohura is) and then turned to head back towards Taumarunui. We rode a heap of other fantastic gravel through here which took us through some really nice country and included some fast gravel along with some tighter hill climbs and descents. All in all some fantastic back country riding. 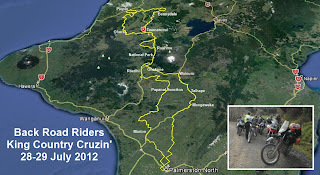 Back in Taumarunui it was time for fuel and to say goodbye to any more gravel as we headed back to National Park. Here I picked up my bag and climbed into my rain suit for a bit of extra warmth and turned for home. I had a pretty good trip back home and although it was chilly I enjoyed the ride and was home well before 7pm. What a fantastic weekend! Thanks guys! More pics here and video to come. A post from on the road - so not much typing and a crappy phone pic. Today I've ridden up to National Park with a few of the team and we've had a blast getting here. We met at a cafe just North of Marton and after an early lunch we took in some great gravel and other back roads to get here. Most of the gravel was in superb nick, although there as a bit of deeper stuff in places earlier in the ride. We even found a few muddy corners for a bit of extra excitement and I had a decent moment coming out of one corner - although at least I stayed upright as a certain Beemer took the oppourtunity to have a quick nap. Luckily it was just a little whoopsie and no harm done - that can be the last time for the weekend eh Neil? After a stop in Raetahi for a drink (see pic) we took in our last little bit of gravel for the day which also included one frosty corner which probably hasn't seen any sun for a few months. So now I'm feet up until we meet shortly for a meal and get together then it'll be some sack time in preparation for a big day of riding tomorrow - the weather looks pretty good although I may have to race the rain home after the ride. 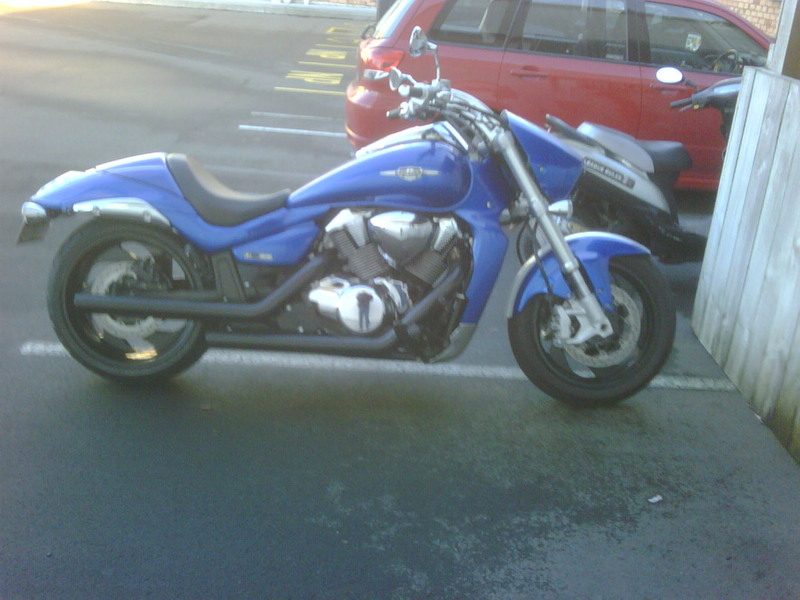 The M109 is nearly 1800cc and 347kg of muscle and attitude and probably not your typical cruiser. This thing makes masses of torque from idle up and forces it into the road via a massive 240 section rear tyre. Add to this an exhaust system (non original) that I'm pretty sure is not there to muffle the beast but to announce it's presence and you have the recipe for a real hooligan of a bike. So naturally I loved it! The forward foot controls took me a second or two to find (and I have to say I weren't my cup of tea) but I was grinning as soon as I let the clutch out and pottered off up to the traffic lights. 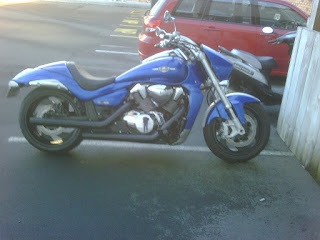 The beast was making some fabulous noises under me and I was looking forward to the unfortunately short ride to work. I never got out of third but with all that torque I was able to trundle along with 2,000rpm or less on the dial (actually an lcd bar graph type rev counter) and simply give the throttle the tiniest nudge to have it pull away. For some strange reason I got quite a buzz out of giving it short squirts and then backing off again, listening to the music the bike made on a closed throttle. I also had the opportunity to nail the bike off the line at a set of lights and yes, my arms are now slightly longer than they were when I got up this morning - talk about fun! And know we get to the handling. Well, if you want outstanding handling you never buy a cruiser. In saying that, when ridden like a cruiser (I've ridden a couple of others in the past) then there was absolutely no issues. The rider is completely unaware of the 347kg weight once under way, the bike is long and low and feels balanced and planted. When turning, the bike leans over so far quite easily and then gets to a certain point where it feels like that's it, but if you apply some muscle then it eventually comes around to your way of thinking and leans over some more. I have a sneaking feeling that this is more to do with that big fat rear tyre than the lazy cruiser geometry. I never scraped anything on the road but then I wasn't trying that hard. Braking was simply a non issue as Suzuki actually puts brakes on it's bikes and that big donk gives masses of engine braking too. On Tuesday night I got to spend some quality time out in the shed fitting the newest (when will it ever end) farkle to the mighty Vee. The DL came with standard Suzuki hand guards. These are great for helping keep the weather off my mitts but only offer minimal protection to the levers and the other stuff that hangs off the bars. I've been lucky that I haven't broken a clutch lever on the two occasions that the bike has decided to have a lie down so it's about time I added this farkle. 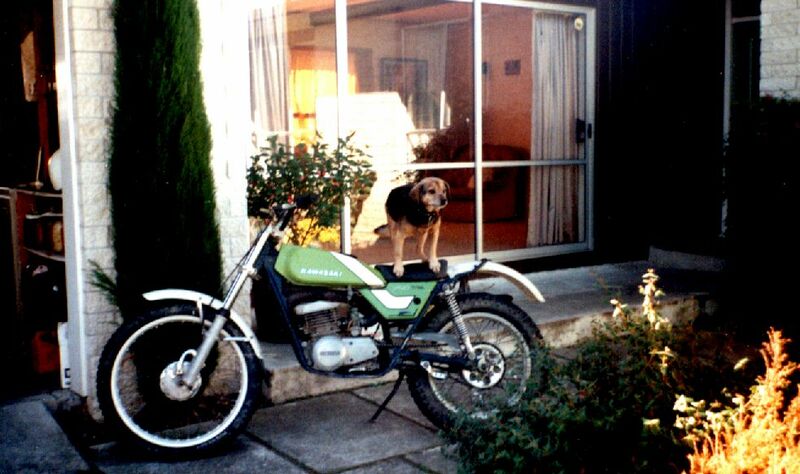 The Bark busters combine some quite solid aluminium crash bars and plastic hand guards. There are generic Bark Busters to suit a range of bikes but in my case there is a DL specific item which means less issues fitting with all cabling and plumbing staying in it's original position and the bracketing fitting over or around it. There are also two options for the hand guards: the Storm and the VPS. The Storms are slightly larger hand guards while the VPS offer a little bit of adjust ability. I chose the VPS. How's it all go together? Next up I had to remove the standard guards and the bar ends from the bike and start installing the brackets and guards. The kit comes with replacement bar end weights that have quite a neat system to hold them in. There is also the option of adding additional Bark Buster bar end weights on the outside of the aluminium crash bar. I didn't buy these but if the new bar ends are not heavy enough I may notice more vibration through the handle bars so I may have to consider the additional weights. Initially I had a few issues fitting the left hand side unit. This was due to not quite knowing how everything was supposed to go together and the position of my heated grip controller. I ended up slowing down, having a play with the RHS and once I had got that sorted then the LHS wasn't a big deal after all. A bit of protection for that clutch lever now eh? RHS - a piece of cake! Once everything was installed but not tightened I fussed around getting everything in the proper position before finally tightening everything up and fitting the guards. The other day I was reading a post by Biggo and in his write-up of a local ride he described how one of the riders suffered a puncture and that they fixed it on the road and managed to get home safely. They had to borrow a compressor and in a comment I mentioned that I carry a compressor with me now. Biggo in return asked me what sort of compressor it was and now that Geoff has posted about his puncture preparedness I thought that I better add my two cents. First up, it appears that I carry the same kit as Geoff previously has and I can vouch for it's effectiveness. On a long weekend away a few years ago my tyres were subjected to a bit of abuse in very hot temperatures (high 30's) and wore a lot quicker than I had expected. Before leaving I was sure that they would last the distance - unfortunately I was wrong. Riding out a gravel driveway in Hicks Bay, a small stone managed to puncture my rear tyre. Quick as a flash, with some guidance from others (we'd already fixed one puncture the night before) we found the leak and had it plugged. Some kind locals then loaned us an ageing compressor which soon had me back up to pressure for the 500km ride home. In Geoff's post he questions the effectiveness of the stick ropes to maintain pressure but if you insert them properly then I believe they are amazingly good. Firstly you thread the rope throw the awl and poke it through the hole and a reasonable way in. Then you give the awl a twist and remove it before cutting off any excess rope and re-inflating the tyre. Both bikes that suffered punctures on this trip were loaded up (one had a pillion as well) and made it home with no issues in very hot conditions. My tyre lost no pressure but obviously came off the bike at the first opportunity. Now to the one thing that I don't like about the kits (although it is a small criticism), the CO2 canisters. These will never inflate you to the required pressure but on the plus side, might give you enough pressure to ride to a compressor. I've solved this by now carrying a compressor. Initially I was going to do what Geoff has done - buy a cheap compressor and break it down to the smallest possible size I could be removing any case or excess bits and bobs. But when I visited Supercheap the compressor I ended up with was on sale and offered a few other handy features. I've left the 12v plug on the compressor as both my bikes have sockets and they're far easier to use than fumbling around for the battery (the Connie's battery is well tucked away). And so far I've been lucky enough to not require the compressor to fix a puncture but it has been used a number of times to top up various bikes' tyres. The compressor is probably quite a bit bigger than Geoff's one but as I'm now getting a bit more off the beaten track with the DL I'm starting to build-up a bit of an emergency tool kit so now have a tool bag that can easily be swapped between top boxes. The compressor, repair kit and a number of tools fit easily in it. So, I hoped I'm prepared for the unplanned mishap but really would prefer to lug this all over the countryside and never need to use it! After posting that video last night I thought that I'd better post up a couple of pics showing that I've actually had a wee bash at trials myself. 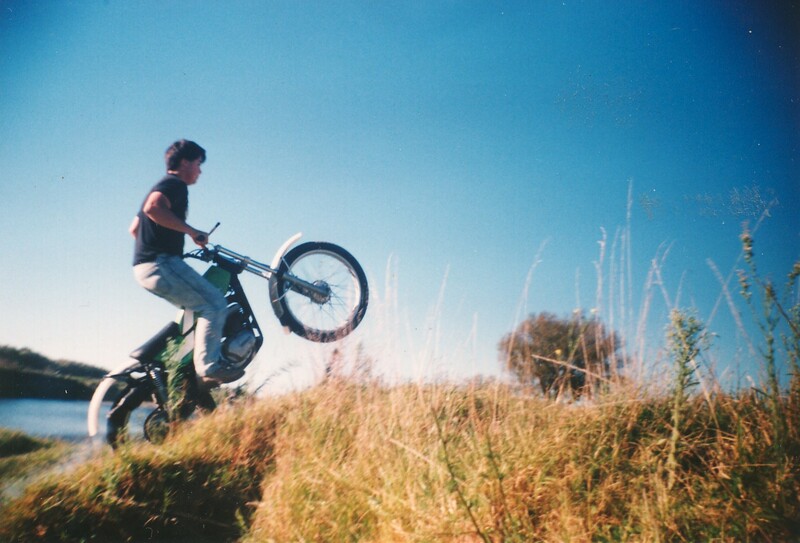 It was a Kawasaki (yes, my first Kwaka) KT250 and I think it was either a '74 or '78 so when I got it in 1990 it was pretty well run in and not quite the sharpest trials tool out there. It featured a mighty 250cc two-stroke motor with plenty of flywheel so it pulled from idle in it's very low first gear. As with all trials bikes the gear lever is positioned a fair way forward of the foot-peg so you have to take your foot off the peg to change gear. This is so that you don't accidentally knock the gear-change while balancing on the pegs and clambering over stuff. I never got seriously into trials but a mate and I would often take the bike down to the local river and play around clambering up banks, over rocks, ride through big puddles and also give it a bit of a thrashing every now when pretending it was actually a motorcross bike. It was pretty good at everything I mentioned except perhaps that last one. At any rate for the piddling amount I paid for it, it gave me a bit of fun and never let me down either. I just had to post this after seeing it on KB! Heading across the top of the Saddle it was nice to be in the sunshine although it was still pretty cold and the views out towards Danniverke were stunning. After getting stuck behind a bus on the descent of the Saddle I stopped briefly in Woodville for a top up before carrying on. 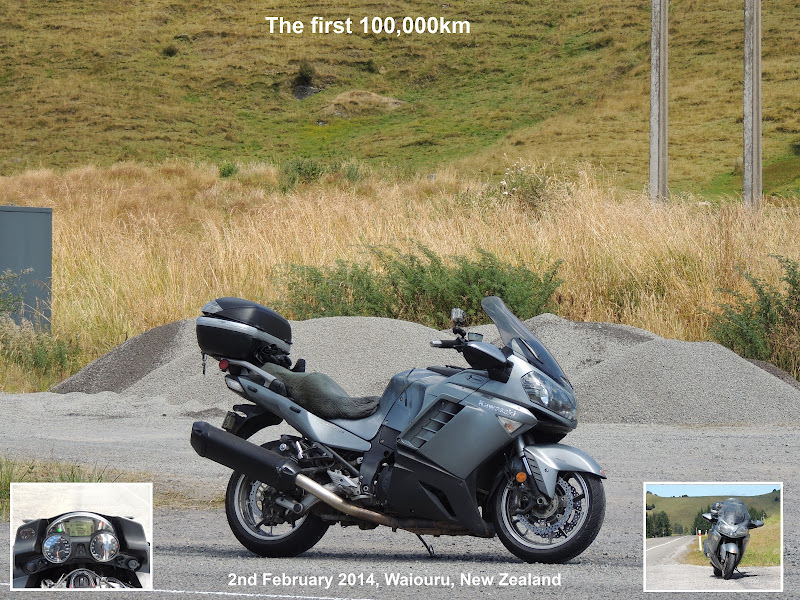 The muddy roadworks I ran into a few weeks ago were all gone and I had a good run up through Danniverke and onto SH50. Riding up over my favourite hill on SH50 I got a bit of a surprise as I rounded a corner to see cars parked all over the place and one head-on into a bank. Luckily everything was all in hand and it looked like the damaged car's occupants were all ok. It must have been pretty recent though as I saw at least two cops (one in disguise) on their way out to sort things out - no ambulances, so that was a good thing. In Napier I spent some time with my folks, my sister and all my nieces before skedaddling at around 2 so I could get home to light my fire nice in early. On my ride home I caught a bit of light rain between Ongaonga and the plains but made good time to Danniverke. In Danniverke I decided that I'd had enough of SH2 and turned off to make for Topgrass Road and my normally route along the ranges to Woodville. However, I took the wrong turn and ended up on a road I hadn't ridden and wondered for a while where I was going to end up - I was wondering whether the road was going to peter out onto gravel and that I was on the wrong bike. A couple of turns (without consulting Captain Zumm to I might add) and I popped out onto Topgrass Road for the short ride ride home where I now have the fire blazing and am just about ready for some dinner. Nice to be home from the cold! On Saturday it was time for a few of the crew to get together for a little ride and then a mid winter barbie with lashings of crap talking to top the day of. Our little pootle turned out to be a quick jaunt out over Vinegar Hill to Hunterville where we paused for a quick caffeine injection and to kick off the bull sessions. We then behaved ourselves as we took in the short stretch of SH1 to the Halcombe turn-off which we took so that a few more delicious curves could be enjoyed before we split up to take various routes home. Later on we reconvened at Meanie & Monie's for a great feed and plenty of bike talk. By the time I left for home it was starting to get a bit frosty but it had been great to get in a good ride with the guys and to catch up with a few who I hadn't seen in a while. A wee while ago Brian sold his VTR but it has stayed local and yesterday it's new owner Lloyd joined Brian and myself for a short little ride around the neighbourhood. We started with a quick squirt over the track, then through some mucky road works (I seem to always be hitting mucky roads on the Connie lately) before turning off to take Nikau Road through to Mangamire. The road wasn't in too bad a condition but as you can see from the video we had to dodge some cattle being moved along the road. There was also another section of roadworks although in this case it was just new seal and no problem. Turning South on SH2 we rode about another about another 5 or 6km before turning off on Hamua Rongomai Road. This is neat little bit of road although at this time of the year there can be some really slippery bits and there is always crap across the road in the odd corner. If you check out the video at 3:50 you'll see a sheep that also gave me a bit of scare for a second - dozy animals! Turning left out of Hamua Rongomai Road took us onto Mangaone Valley Road which eventually makes it's way into the back of Pahiatua. This is another neat bit of road but also has the normal back road hazards and there are several places where cattle are walked across the road and leave their mess for you to avoid. In Pahiatua we stopped for a spot of lunch and to see how Lloyd was going on the VTR. He was having a ball and wanted more so instead of heading back home I led the guys through to Oringi and then out Top Grass Road and Pinfold roads before finally taking on the Saddle and cruising back into town. A nice little ride of about 170km and only a few spits of rain which failed to put a damper on the day.